The Acer V5-552G-X414 is an all-purpose laptop that looks nice, boots fast, and delivers more than enough everyday performance for the average user. It renders movies smoothly on its 15.6-inch, 1366-by-768-pixel display, and it plays a good game up to a resolution of 1024 by 768. The keyboard is better than average, but the touchpad isn't a favorite. The Acer V5 weighs 4.41 pounds—just over 5 pounds when you add its AC adapter—and is handsome in a minimalist fashion. Our test unit appeared entirely in slate gray except for the black keys on its short-throw keyboard—one of the better keyboards I've tried (if not quite up to Lenovo or recent Dell quality). 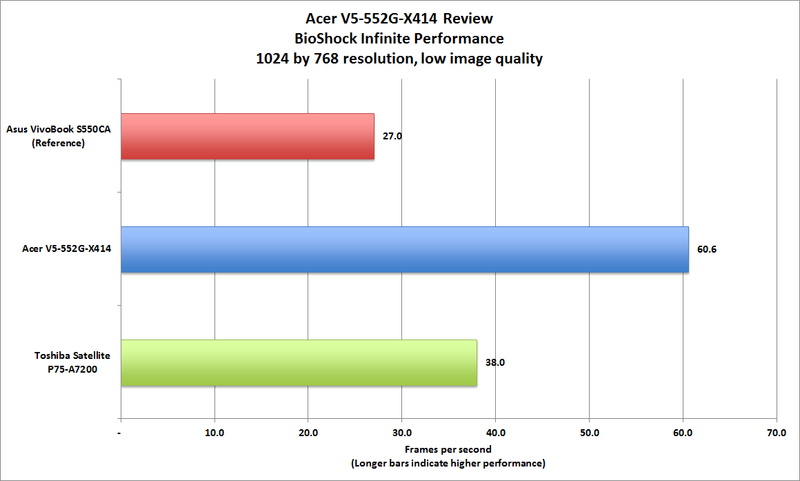 Acer's decision to use an AMD processor helps keep the V5's price down, but it also crimps its benchmark performance. The $630 configuration Acer sent is built around an AMD A10-5757M CPU, with integrated HD 8750M graphics. Throw in 6GB of memory and a 5400-rpm, 750GB hard drive, and you have a notebook that scored a pedestrian 124 on PCWorld's Notebook WorldBench 8.1 test suite. Subjectively the unit feels snappy enough while on AC power, but less so when it's trying to preserve battery life. Most of our test games, however, were playable at 1024 by 768 resolution, which isn't something we can say about all laptops in this class. A 15.6-inch display looks ginormous if you've grown accustomed to 13.3-inch models. The flip side of using an AMD CPU is that you get better integrated graphics than what Intel can currently provide. 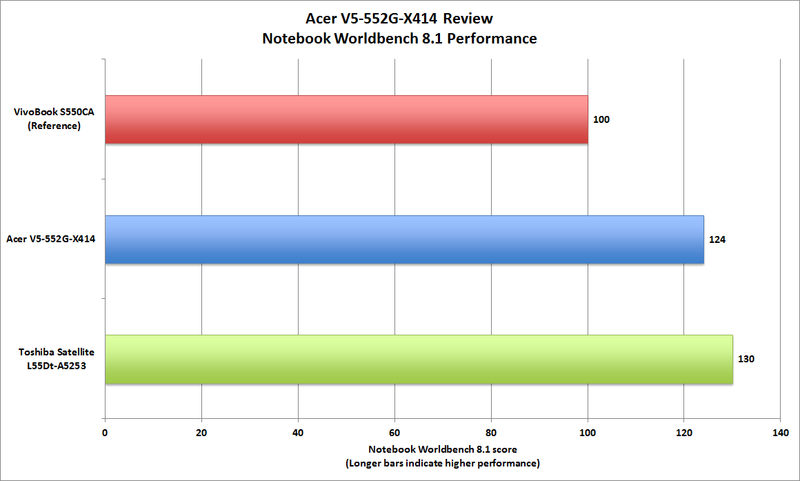 Acer ships the V5 with a fair amount of software on board. Some of it is welcome, including the company's own recovery-management utility, a button to make up for Windows 8's missing Start menu, Nero Backup Essentials, and Dolby Home Theater to perk up the sound. But you also get a lot of useless bloatware, such as links to Netflix and eBay. You'll want to spend some time identifying and removing junk that might spawn unneeded background processes and sap the notebook's performance. If you need a notebook with a large display, Acer's V5 is a well-priced solution. Just don't expect knock-your-socks-off performance.